After several projects, including collapsed or were pushed aside including a biography of Groucho Marx Rob Zombie retreated back into the horror realm with 31, a well made film with a script that simply isn't there. The plot of the film has a group of carnival workers being kidnapped and forced to play a game called 31 on Halloween. If they can survive for 12 hours in some sort of vast complex while hunted by clown like nazis then they can go free. That's it, that the plot. There is nothing else here. Well done scenes of mayhem all nicely staged without any sort of real reason to see them. There is no linking material other than a slender thread with the result that we just don't care. More importantly it just doesn't feel finished. What the film feels like was Zombie brought a bunch of his friends together, many are Zombie regulars, and they made stuff as they went along. They probably assume that they'd work out how to link it all up but they never did. To be honest the bits on their own terms aren't bad. The flop that you kind of assume the carnival people will be the bad guys but are instead victims works nicely. The problem is nothing hangs together. The absolute best tings in the film are the opening and closing with a white faced nut job- the first where he torments a chained up minister. Its a glorious piece that has a great deal of promise- which is never realized until the final sequence of the lone survivor stumbling down a road as the white faced nut drives up in a black van. The sequence scored to Aerosmith's dream on is a masterpiece- which regrettably most people will never see since most people will have turned the film off long before. 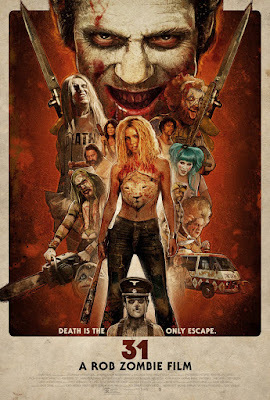 WHile ROb Zombie is great director who ends up with uneven films- here I have to side with the nay sayers and wonder what the hell he is doing.